What is your favorite Linux file manager? I have used each of these at various times for various reasons and they all have qualities to recommend them. Ranging from very simple to feature-packed, there is a file manager available that will meet your needs. Midnight Commander and Krusader are my favorite file managers, and I use both quite frequently, but I also find myself using Dolphin and Konqueror. This article looks briefly at each of the file managers listed above and compares a few of their main features. Unfortunately, there is not enough space to do each of these file managers justice. I hope to have some future articles that provide a more detailed look at two or three of these powerful tools. 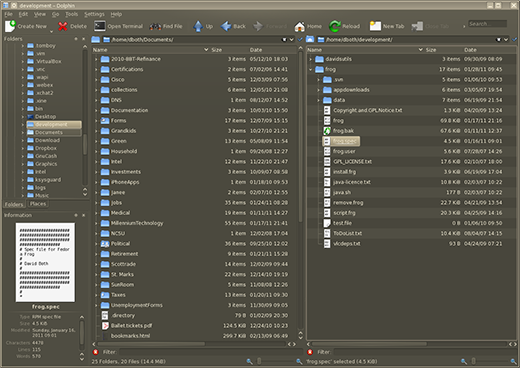 Each of these file managers is configurable, with Krusader and Konqueror being the most configurable of the GUI-based file managers. 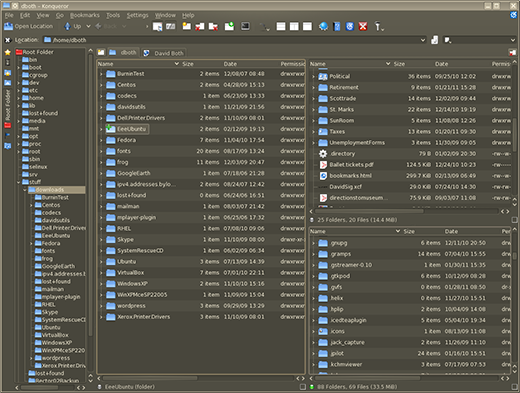 Midnight commander, the lone text-based file manager, is also quite configurable. None of the file managers look by default like they do in this document. I have configured them to look like this on my systems. Except for Midnight Commander, the colors are managed in the "Application Appearance" section of the KDE System Settings application and are not configurable within the applications themselves. Like most Linux distributions, Fedora has a default file manager, which is currently Dolphin. The Linux desktop usually has an icon that looks like a little house—that's your home directory/folder. Click on the Home icon and the default file manager opens with your home directory as the PWD, or Present Working Directory. 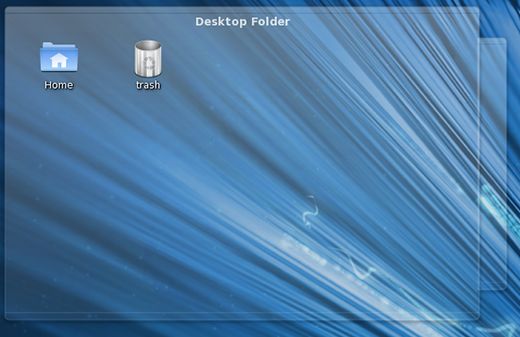 In current releases that use KDE 4.1 or above, the Home icon is located in the Desktop Folder along with the Trash icon, as shown below. In KDE, the default file manager can be changed using System Settings > Default Applications > File Manager. Midnight Commander is a text-based Command Line Interface (CLI) program. It is particularly useful when a GUI is not available, but can also be used as a primary file manager in a terminal session even when you are using a GUI. I use Midnight Commander frequently because I often need to interact with local and remote Linux computers using the CLI. It can be used with almost any of the common shells and remote terminals through SSH. You can start Midnight Commander from the CLI with the mc command. The above image shows Midnight Commander in one tab of the Konsole program. The user interface for Midnight Commander is two text mode panes, left and right, which each display the contents of a directory. The top of each pane displays the name of the current directory for that pane. Navigation is accomplished with the arrow and tab keys. The Enter key can be used to enter a highlighted directory. 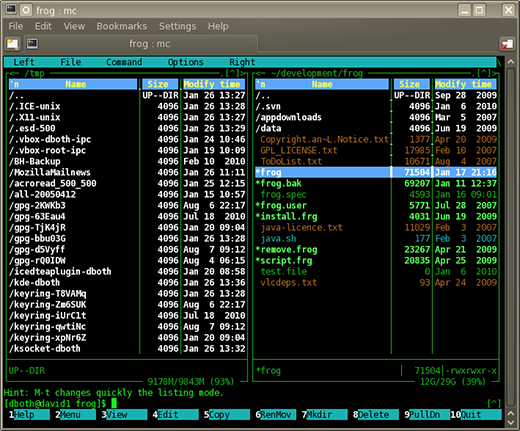 Along the very top of the Midnight Commander interface is a menu bar containing menu items for configuring Midnight Commander, the left and right panes, and for issuing various file commands. The bottom portion of the interface displays information about the file or directory highlighted in each pane, a hint feature and a line of function key labels; you can simply press the function key on your keyboard that corresponds to the function you want to perform. Between the hint line and the function keys is a command line. 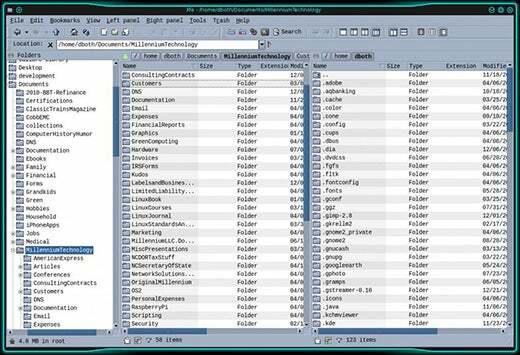 Krusader is an exceptional file manager that is modeled after Midnight Commander. It uses a similar two-pane interface, but it's graphical instead of text-based. 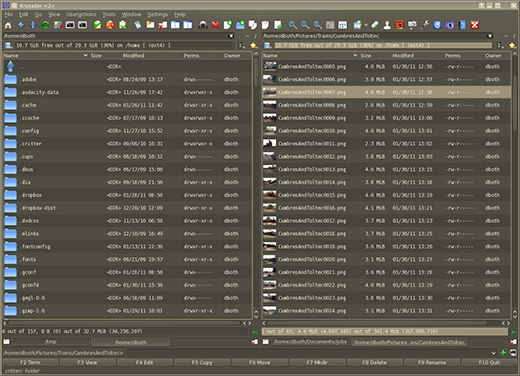 Krusader provides many features that enhance its functionality as a file manager. Krusader allows you to use the same keyboard navigation and command structure as Midnight Commander, and also allows you to use the mouse or trackball to navigate and perform all of the standard drag and drop operations you would expect on files. The primary user interface for Krusader, much like that of Midnight Commander, is two text-mode panes—left and right—which each display the contents of a directory. The top of each pane contains the name of the current directory for that pane. In addition, tabs can be opened for each pane and a different directory can be open in each tab. Navigation is accomplished with the arrow and tab keys or the mouse. The Enter key can be used to enter a highlighted directory. Each tab and pane can be configured to show files in one of two different Modes. In the illustration above, files are displayed in the detailed view that—in addition to the file name and an icon or preview—shows the file size, the date it was last modified, the owner, and the file permissions. Along the very top of the Krusader GUI are a menu bar and toolbar containing menu items for configuring Krusader and managing files. The bottom portion of the interface displays a line of function key labels; you can simply press the function key on your keyboard that corresponds to the function you want to perform. At the bottom of the interface is a command line. Krusader automatically saves the current tab and directory locations as well as other configuration items so that you will always return to the last configuration and set of directories when restarting the application. Konqueror is another powerful and flexible file manager with many features. It has one feature that none of the other file managers do: it doubles as a web browser. Just type the URL of the web site you want to view in the location bar. The main thing that sets Konqeuror apart from the crowd is the ability to open multiple tabs, each of which can have one or more directory navigation panes. In the image below, one tab has been divided into three panes; one on the left side and two on the right. The sidebar at the far left is used to provide rapid navigation of the entire filesystem. One thing I particularly like about Konqueror is that it provides an excellent high-level view of your directory structure, both in the sidebar and in the directory panels. This makes it easier to locate and delete files and directory trees that are no longer needed. It also enables easier navigation and reorganization of the directory structure. The primary user interface for Konqueror, much like that of Midnight Commander and Krusader, is text-mode panes that display the contents of a directory. Konqueror, however, allows multiple panes, and the default single pane can be split both horizontally and vertically as many times as it makes sense to do so. Konqueror also supports multiple tabs (at the top of the directory panes this time) and a different set of directories can be open in each tab. Navigation is accomplished with the arrow and tab keys or the mouse. The Enter key can be used to enter a highlighted directory. The Location widget near the top of the Konqueror GUI contains the full path of the currently selected pane. Each tab and pane can be configured to show files in one of two different Modes. In the above image, files are displayed in the detailed view which, in addition to the file name and an icon or preview, shows the file size, the date it was last modified, the owner, and the file permissions. Along the very top of the Graphical User Interface are a menu bar and tool bar containing menu items for configuring Konqueror and managing files. Once you have the tabs and panes set up the way you want them, you can save it so that Konqueror will always start with that configuration. Dolphin is very much like Konqueror and Krusader. It has two directory navigation panes and a sidebar that allows for easy filesystem navigation. It supports tabs. The primary user interface for Dolphin can be configured to be very similar to Konqueror and Krusader. Using two panes which each display the contents of a directory, it does not support splitting the panes. Navigation is accomplished with the arrow and tab keys or the mouse. The Enter key can be used to enter a highlighted directory. Dolphin also supports expanding the directory trees (folders) in both the sidebar navigation pane and the directory panes. Although Dolphin does support tabs, when restarted it always reverts to the default of one pair of directory panes that display your home directory. 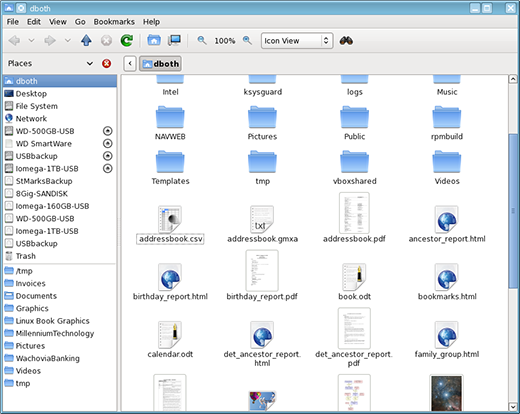 Nautilus has a single directory pane with which to work. It also has a sidebar for navigation. Nautilus is a simple, decent file manager that is good for many beginners due to its simplicity. Nautilus is typically found in systems where GNOME is the desktop, but it can also be installed and used with KDE. The primary user interface for Nautilus is fairly simple with a navigation sidebar and a single directory window in which to work. It does not support multiple tabs or splitting the panes. Navigation is accomplished with the arrow and tab keys or the mouse. The Enter key can be used to enter a highlighted directory. Thunar is another lightweight file manager. It is so much like Nautilus in the way it looks and works and that there is nothing else to say about it. The PCManFM file manager is intended to replace Nautilus and Thunar. In fact, based on the way they look and work so much alike, they may actually share some common code. These three file managers have the fewest configuration options and all share the same simple interface. XFE is one of the more interesting of the file managers as it has an interface all its own and is a bit more flexible than Nautilus, Thunar, and PCManFM. XFE may be configured to display one or two directory panes, and the navigation bar is optional. It performs all the expected drag and drop functions, but it requires some manual configuration to associate the correct applications like LibreOffice with specific file types. It has a reasonable set of configuration options, but nowhere near those of Konqueror or Krusader. XFE is also quite difficult about retaining its own set of "themes" and has no option to use the desktop color scheme, icons, decorations, or widgets. I know that there are other file managers, one of which may be your favorite. Your choice of file manager should be the one that works best for you. GNU/Linux provides several viable choices and one will most likely meet most of your needs. If your favorite does not meet your needs for a particular task, you can always use the one that does. All of these file managers are free of charge and distributed under some form of open source license. All are available from common, trusted repositories for Fedora and CentOS. I plan to write some additional articles that cover some of these file managers in a bit more detail. Please leave your comments to let me know which ones you would like to know more about. "I know that there are other file managers, one of which may be your favorite"
RoxFM . One of my favorites. Agreed! SpaceFM is by far the best in my opinion. The most annoying feature Nautilus removed was the ability to do split view between 2 directories. Unfortunately not available on Linux is Microsoft Explorer. This is by far the best file manager I know. Very neat & functional, unlike the bulky, clumsy, clunky Linux offerings. Windows Explorer? Why not go the distance and use File Manager? I've been running Directory Opus on Linux under Wine for a couple of years. It's easily the best file manager available, but is fairly pricey. Other file managers worth mentioning are gentoo file manager (no relation to the distribution; it predates it) and xfm, which is very lightweight for a graphical file manager. Nemo from Cinnamon is amazing. I love it. It is better than Explorer and does everything I want in a file manager. I use the Cinnamon DE so Nemo is the default file manager that is included with my DE of choice. I think the use of GNU when referring to Linux needs to be stopped. GNU is a project that is owned by Richard M. Stallman and the Free Software Foundation. Stallman himself says that Linux is not a part of his operating system he calls GNU. Linux is built by Linus Torvalds with its own goals and direction and doesn't have the same goals or direction that GNU has. If you were a part of Free Software Foundation or standing in RMS's shoes, then making the distinction that GNU is using the Linux Kernel is important, because you aren't using the full GNU operating system promoted by the Free Software Foundation, and their understanding of the word "free" has a specific meaning to them which is not necessarily shared by the rest of the Open Source world. So Linux (as in the OS) should be called Linux and GNU/Linux is something that RMS is required to say when his GNU OS isn't using the GNU kernel he calls "Hurd". Since Hurd isn't as popular or even as mature as the Linux kernel, GNU is better using the Linux kernel in most cases. RMS should be embarrassed to suggest that we all say GNU/Linux when referring to Linux. Calling Linux, GNU/Linux, means he is compromising his passion and position on what free software means to him. I fully respect RMS for his passion and focus and goals, and what he has accomplished, but I think he has lost sight of what's important to him because of the popularity of Linux. Envy is ugly and for this he has lost respect points. It is completely appropriate to refer to Linux distros as GNU/Linux. As I'm sure you know (but perhaps some readers do not), Linux is just the kernel. Every Linux distro I've seen includes the Linux kernel, a full OS (much of which is GNU), and many applications (many of which are GNU). What is the problem with giving credit where it is due? Strip GNU software out of your favorite Linux distro and let me know how useful it remains. If you don't mind java as a dependency, give mucommander a try. double commander not in this list? This list is missing Ranger console file manager. Rox Filer is a very fast file manager and clean on screen - just takes a little while to get used to and then you grow to really like it. XFE as mentioned in the article is also another excellent File Manager similar to Krusader but probably not as crowded on screen. I normally use Dolphin and Krusader when I am wanting to quickly change File/Folder permissions etc. that is of course if I haven't already done the job with the KDE Services which I use with right click in Dolphin (Services). I love that suite of scripts - similar to those available in Nautilus if using Gnome. Linux has a wealth of File Managers and you would have to be difficult to please if you can't find one that suits your needs and preferences. I always opt for a dual pane file manager whereas a lot of people ex Windows may prefer a single pane similar to Windows Explorer - that is one thing I detest using and it astounds me that Microsoft continue to stick with it? You just have to look at all the third party alternatives out there which people download to get away from Explorer. Thanks for the article David - appreciate your time and efforts to alert people to their options. how can i see multiple tabs in Konqueror? and how do i turn on panes ? The review from Nautilus is not very extensive and I think needs to be checked carefully as I think there are some mistakes and features missing there: for example, it DOES support multiple tabs. You also neglected to show off Ranger for reasons unknown to me. Someone else has already mentioned this as well. If you decide to cover Ranger, make sure to enabled image previews. I think it's one of the neatest features, but it's not enabled by default. It requires you to create a config file. @ Andres Gomez and Bradley Haggerty, you are both correct in that both Thunar and Nautilus can do tabs. Those two file managers are so much alike that I would expect both to have the same features. Thank you both for pointing out this fact. As has been mentioned by others, the amount of space allocated to each file manager in this article is very limited. I am working on more articles that will present a more detailed view of some of my personal favorite file managers but neither Thunar nor Nautilus is among them at this time. Perhaps you two would like to write reviews of those and submit them here for publication. As for Ranger and two or three other file managers that I have not heard of previously, I have now and have already tried some of them for myself. One of the things I really like about writing - and the training classes I give - is that I always learn more because other people know so many things that I do not. But that is why we share - OpenSource - our knowledge with each other, so we can all learn. Thanks! There's Sunflower too, and Ranger,, for when PCmanFM isn't easiest. This is a macro-programmable file browser that allows you to associate arbitrary actions with any group of selected files. It is also cross-platform and runs on Linux, OSX, BSD, and Windows. I think the most universal Linux file manager is still GNU Midnight Commander, a.k.a., 'mc' as described in en.wikipedia.org/wiki/Midnight_Commander. mc works on the terminal/console of every distro I've ever used, and can be brought up in X through using the universally-present xterm/xconsole. Why is Double Commander not in the list? It perfectly works on different Linuxes, I'm using it long time on Linux Mint, Ubuntu, Open Suse, Windows 7, Windows 8. It is also available for Mac. Well, one reason is that I have never heard of it before. But now I have, along with some others that I also was unfamiliar with. For the article, I did want to stick with file managers that are provided by the Fedora distribution or an "official" repository such as RPMFusion. Even then, there were more than I knew about. Great article. You should point out if the file manager is Qt or GTK based though. Konqueror actually is not a "File Manager", it is a real web browser ! But it has a "plugin" called "Dolphin widget". That's why Dolphin is so similar with Konqueror, because it actually is ! Give the author a break. If he were to do a summary of not only every Linux compatible file manager but also cover all their comparitive functions you would be looking at upwards of a hundred FMs and likley a few hundred words for each. It would likely take so much time that it would no longer be current unless he devoted full time to it. I guess maybe better pick of titles and to change it to an article series on Linux compat FMs. That way you could add a functions chart with the various FMs and just too it as you cover more and more FMs. Then put out new additional articles as you cover more and more FMs and their details. After all he did not say this is a list of the best of the FMs but just simply FMs he had looked at he thought others should take a look at as well if considering a change.